(W) Paul S. Kemp An original novel of the good, the bad, and the insane of the Star Wars galaxy, following on the events of the New York Times-bestselling novel Crosscurrent. When a ship full of Sith warriors arrived in Galactic Alliance space, the fight to destroy it accidentally uncovered a hidden menace: a long-hidden group of clones, secretly created as insidious weapons capable of wielding the Force and heedless of the differences between light side and dark side. Now the clones have escaped�and evidence suggests that they are flawed by genetic disease and violent madness. 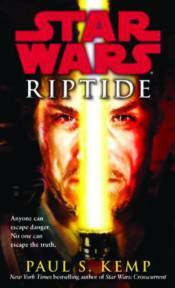 Jedi Knight Jaden Korr pursues the clones, hoping to heal them but prepared to destroy them. What he doesn�t know is that Sith agents are hot on his heels, determined not only to recover the clones for their Master but to capture Jaden for their own dark-side purposes. In a life-or-death battle, Jaden will confront a shocking reality that will rock him to his core and bring him face-to-face with the question of what makes a man . . . and a Jedi.